The Synthino XM Drone firmware lets you create strange, pulsating drones. It has 2 independent oscillators, each with its own volume control, filter, and 3 LFOs. Each oscillator has a pitch LFO, filter LFO, and amp LFO. That’s a total of six independent LFOs that modify the drone sound all at the same time! osc 1/2 : this button lets you specify which oscillator you are controlling with the pots. Some of the pots are dedicated to a specific oscillator (the volume and filter cutoff pots), but other pots are shared. When you press this button and the LED illuminates, that means you are controlling oscillator 2 with the top row of pots. When the LED is off, you are controlling oscillator 1.
filter LFO : Press this button to activate filter LFO control for the selected oscillator on the LFO rate and depth pots. The filter LFO causes the filter cutoff to oscillate around the current filter cutoff frequency. If you don’t hear much change, reduce the filter cutoff for the currently selected oscillator. The LED for this button is illuminated when filter LFO control is activated. amp LFO : Press this button to activate amp LFO control for the selected oscillator on the LFO rate and depth pots. This LFO controls the volume of the oscillator and causes it to oscillate around the current volume setting. The LED for this button is illuminated when amp LFO control is activated. When neither the filter LFO nor amp LFO are activated, the LFO rate and depth pots control the pitch LFO for the selected oscillator. pitch/osc 2 detune : when oscillator 1 is selected (osc 1/2 button LED off), this pot controls the overall pitch of the drone. Both oscillators will play the same note. When oscillator 2 is selected (osc 1/2 button LED on), this pot detunes oscillator 2 relative to oscillator 1.
osc 1 waveform/osc 2 waveform : this pot lets you select which waveform to use for the currently selected oscillator (as selected by osc 1/2 button). LFO rate : controls the LFO frequency for the currently selected oscillator and LFO. When neither the filter LFO nor amp LFO buttons are activated, the pot controls the pitch LFO. Otherwise it modifies either the filter LFO or amp LFO for the currently selected oscillator. LFO depth : controls the LFO depth for the currently selected oscillator and LFO. Turn the osc 1 volume all the way up, and the osc 2 volume all the way down. Set both osc 1 and osc 2 filter cutoff pots to max value. Set LFO rate and LFO depth pots to minimum values. Press start/stop button to start the drone. Use the osc 1 waveform pot to select a waveform. The first four waveforms are sine, triangle, saw, square. Try the saw waveform. Adjust the pitch pot to set the frequency of the drone. Now turn the osc 1 volume down and turn the osc 2 volume up. Press the osc 1/2 button to select oscillator 2. The LED for this button will be on. Use the osc 2 waveform pot to select a waveform. Try selecting the saw waveform (3rd waveform) for this oscillator also. Now turn up the osc 1 volume. The osc 1/2 LED should still be on. You should now hear both oscillators but since they are the same pitch and waveform, they sound the same. Turn the osc 2 detune pot to detune oscillator 2 relative to oscillator 1. This provides width to the sound and you can hear the two oscillators beating against one another. Try adjusting the filter cutoff pots for each oscillator. Now let’s play with the filter LFO for oscillator 1. Press the osc 1/2 button again to select oscillator 1. LED will be off. Set osc 1 filter cutoff to the halfway point. Increase the LFO depth pot to maximum. Now adjust the LFO rate pot to set the rate of filter oscillation. You should hear the filter cutoff rising and falling. 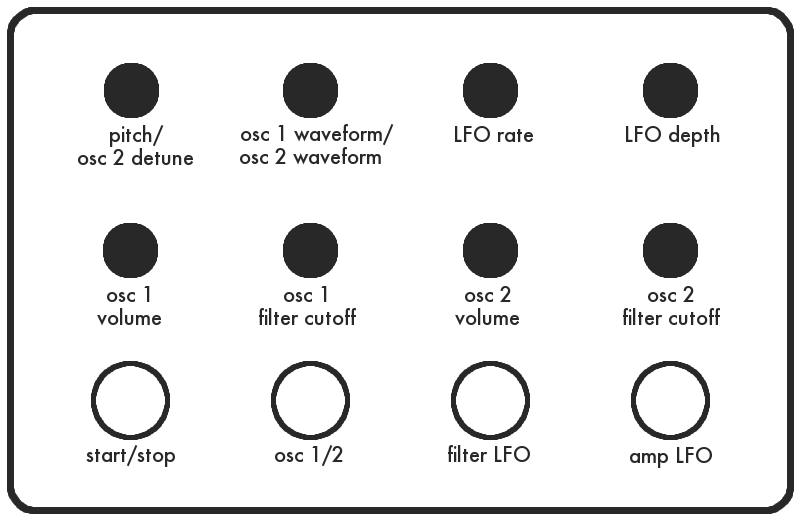 Adjust the osc 1 filter cutoff to hear how the LFO affects the filter. Now experiment with the amp LFO and pitch LFO for each oscillator. Just pay attention to which oscillator you have selected with the osc 1/2 button and which type of LFO you are modifying with the LFO selection buttons. Also try different waveforms on each oscillator. Have fun!